The Wetherby hotels listed below are either in the town or we have given a rough guide as to how far they are from Wetherby. We hope you enjoy your stay and find your ideal accommodation. Positioned at the end of a long dramatic drive, surrounded by a hundred acres of woodland and manicured lawns. Wood Hall is extremely well located. Close to Leeds, Harrogate and York. In the heart of Yorkshire, this 4-star hotel offers free Wi-Fi and free parking. Historic York is only 15 minutes away. Byron Bar features oak panelling and an historic fireplace. The Courtyard Restaurant has a fine menu, and oak beams. With a convenient location, just off junction 46 of the A1 (M), this new hotel offers free Wi-Fi, free parking and comfortable, modern en suite accommodation at great-value rates. Stay at the Ramada Wetherby and experience everything you'd expect from an international hotel company. 3 star property with easy access to motorway network. 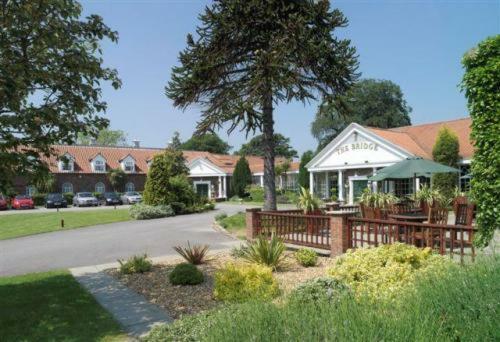 For hotels accommodation in other areas near to Wetherby Yorkshire see Knaresborough hotels & Harrogate hotels.